When I was in college, I used to come home from class, studying AND my full time job and sew. Some of my outfits were awesome and some looked a little crazy. 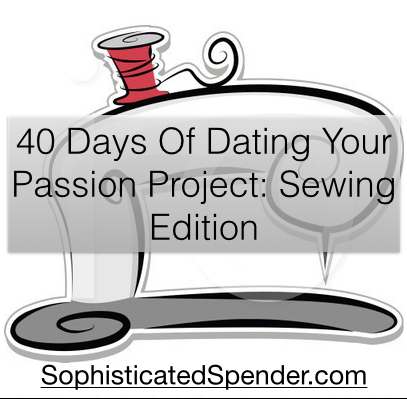 So this time around, my next 40 Days of Dating Your Passion Project would bring me back to the sewing table. Earlier this month I attended a Sip And Sew and it re-sparked my interest in sewing. I made a skirt. I hate it as a skirt but it’s super cute as a tube top. I totally think I can start my very own class with a few of my friends. I’ve been saving pictures, links and ideas for a few of the things I’d like to make. So follow me on my sewing journey! I will begin on August 1st. What will you date for the next 40 days? Some of you have already told me. So if you haven’t done so already, please shoot me an email!